Jordon Macedo is the Deputy Safeguarding Officer at St Charles Catholic Sixth Form College, but his commitment to both students and staff at the College goes well beyond his job description. Speaking about Jordan and the approach he takes to his work, Elaine Taylor, the College Principal, said: "Jordan is always prepared to support students outside the college day, if necessary, and I know how much the students appreciate what he does for them." In his main role as Deputy Safeguarding Officer, Jordan works with many vulnerable students who need significant support and guidance and they feel comfortable approaching him if they need someone to talk to. He really has the needs of the students at the heart of everything he does and this is demonstrated in his organisation of events like Anti-Bullying Week and Mental Health Week. He is a member of the College’s team of pastoral leaders, who are constantly looking after the students of St. Charles, helping them overcome barriers to achieve their full potential. Supporting staff and students with the numerous charity events that take place in College. Accompanying the PE department to their away games for both football and basketball. He has an excellent rapport with the teams; most of these games go well beyond the College day. Accompanying the Chaplain and students on a 4 day College retreat to Kintbury. He encourages many of the students he works with to go on the trip, which really develops their confidence and independence. He has been fully involved in the Jack Petchey award over recent years and attends all the events. He organises the Thought for Day for the College, which provides an opportunity for daily reflection for all. Jordan contributes so much to the St Charles community and it is always done in a calm and unassuming manner. 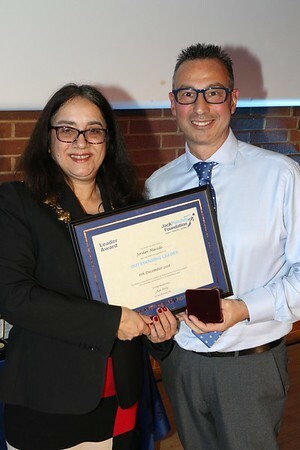 He is a worthy recipient of the Jack Petchey Leader Award. Jordan was presented with his Jack Petchey Medal at the annual awards ceremony at Kensington Town Hall on 4th February 2019 in front of family and several St Charles students.